Lantana camara is a low erect or subscandent, vigorous shrub with stout recurved prickles and a strong odour of black currents; it grows to 1.2-2.4 metres (or even more); its root system is very strong, and it gives out a new flush of shoots even after repeated cuttings; Leaf ovate or ovate-oblong, acute or subacute, crenate-serrate, rugose above, scabrid on both sides; Flower small, usually orange, sometimes varying from white to red in various shades and having a yellow throat, in axillary heads, almost throughout the year; Fruit small, greenish-blue black, blackish, drupaceous, shining, with two nutlets, almost throughout the year, dispersed by birds. Seeds germinates very easily. (Sastri and Kavathekar, 1990). It is an artificial hybrid species that has been subject to intense horticultural improvement in Europe since the sixteenth century and now exists in many different forms or varieties throughout the world. Flower colour has been the primary feature for distinguishing between different forms. In Australia, these are Red, Pink, White/Pale Pink and Orange (Parsons and Cuthbertson 1992, in Thomas and Ellison 1999). Scott (1998) has proved with RAPD analysis that there is great genetic diversity within L. camara and challenged the assertion that flower colour is the primary determining factor in describing varieties (in Thomas and Ellison 1999). Inflorescences are produced in pairs in the axils of opposite leaves. In almost all colour forms, the flower opens yellow and changes to pink, white or red depending on the variety. In the forms where this does not occur, a yellow ring is present around the opening to the corollary tube (Sinha and Sharma 1984, in Day et al. 2003). The yellow colouration is known to be a visual cue to pollinating insects, and the act of pollination may stimulate colour change (Barrows 1976, Mohan Ram and Mathur 1984a, in Day et al. 2003). Lantana camara is a highly variable species. It has been cultivated for over 300 years and now has hundred of cultivars and hybrids. These belong mostly to the L. camara complex. Cultivars can be distinguished morphologically (variation in: flower size, shape and colour; leaf size, hairiness and colour; stem thorniness), physiologically (variation in: growth rates, toxicity to livestock) and by their chromosome number and DNA content (Pierre Binggeli, 1999). Introduction of six bird species (including Chinese turtledove, Streptopelia chinensis, and the Indian mynah, (Acridotheres tristis) that feed on lantana berries, has been implicated in the spread of the weed throughout the Hawaiian Islands as no native bird in Hawaii has been observed to eat the fruit (Perkins and Swezey 1924 in Day et al. 2003). In Guam, it has been suggested that, as a result of the introduced brown tree-snake (Boiga irregularis) preying on native bird populations, there are fewer frugivorous birds to disperse lantana seeds (R. Muniappan UG, pers. comm., in Day et al. 2003). Consequently lantana infestations are increasing more slowly, and this may partially explain why Guam has had better success with biological control of lantana than other nearby islands (Muniappan 1988, in Day et al. 2003). In many regions, lantana has become a dominant component of natural and agricultural ecosystems. The rapid removal of natural forests without replacement by structurally similar\r\nnative vegetation may be partially replaced with thickets of lantana. Consequently, the amount of available habitat for native animals may decrease. 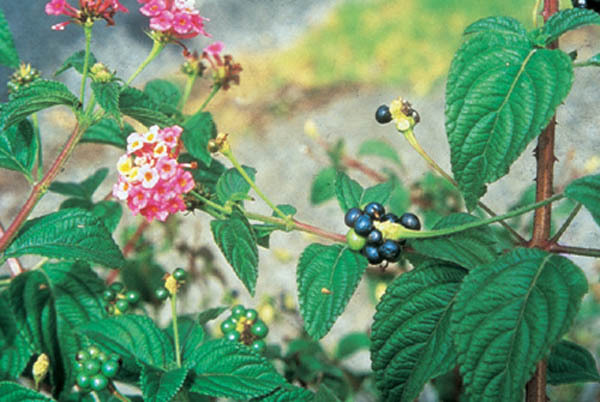 In some areas, weeds such as lantana may provide shelter and vital winter food for many native birds. A number of endangered bird species utilise lantana thickets when their natural habitat is unavailable. In Australia, the vulnerable black-breasted buttonquail, Turnix melanogaster, feeds and roosts in lantana thickets adjacent to its more favoured habitat, vine forest (Smith et al. 1998, in Day et al. 2003). While buttonquails prefer intact vine forest, lantana provides an important temporary refuge for them between forest remnants (Smith et al. 1998, in Day et al. 2003). In central Kenya, where natural riverine thickets have been almost completely cleared, the endangered Hinde’s babbler, Turdoides hindei, has become dependent on lantana thickets, and unless sufficient suitable natural habitat can be restored the survival of this species depends on the retention of lantana infestations (Njoroge et al. 1998). Apart from benefiting some bird species, lantana is a major nectar source for many species of butterflies and moths. In most of the high volcanic island groups in the Pacific, the distribution of lantana is limited by: its inability to survive under dense, intact canopies of taller native forest species; its susceptibility to frosts and low temperatures; its low tolerance to saline soils; its tendency to rot in boggy or hydromorphic soils; it having never been introduced to some islands; insufficient water, due to low rainfall and/or coralline soils with poor water-holding capacities; and high incidence of tropical hurricanes (Thaman 1974, in Day et al. 2003). Lantana flowers in most places all year round if adequate moisture and light are available (Gujral and Vasudevan 1983, Graaff 1986, in Day et al. 2003), with flowering peaking during the wet summer months. In cooler or drier regions, flowering occurs only in the warmer or wetter months, due to frost or drought damage (Winder 1980, Swarbrick et al. 1998 in Day et al. 2003). Plants can flower as early as the second growing season. Initially, lepidopteran species were thought to be the primary pollinators of lantana (Dronamraju 1958, Schemske 1976, Kugler 1980, Hilje 1985, in Day et al. 2003). Some butterfly species visit certain lantana taxa more frequently than others due to differences in corolla length, inflorescence diameter and number of flowers per inflorescence. According to this view, different varieties of lantana may have different species of pollinators. Therefore, there may be little cross-pollination between species or varieties of lantana both in the naturalised and native ranges of the section Camara (Dronamraju 1958, Schemske 1976, in Day et al. 2003). More recently, it has been suggested that thrips play a more important role in the pollination of lantana than Lepidoptera; unlike butterflies, thrips are present all year round, and are more efficient pollinators (Mohan Ram and Mathur 1984b, Sinha and Sharma 1984, in Day et al. 2003). In India, the exclusion of butterflies did not reduce seed-set and Mathur and Mohan Ram (1986) proposed the introduction of biocontrol agents to reduce thrips populations in an attempt to decrease pollination and the quantities of seed produced by lantana. In addition to butterflies and thrips, sunbirds (India) and hummingbirds (Brazil) are believed to play a minor role in pollination (Winder 1980). There are conflicting reports over lantana’s ability to selfpollinate. Pollination results in 85% fruit-set (Hilje 1985), with each infructescence bearing about eight fruits (Barrows 1976, in Day et al. 2003). Seeds are widely dispersed, predominantly by birds, but also by kangaroos, bearded dragons, sheep, goats, cattle, foxes, jackals, monkeys and possibly rodents (Bisht and Bhatnagar 1979, Clifford and Drake 1985, Sharma et al.1988, Wells and Stirton 1988, in Day et al. 2003). In continental areas, many indigenous bird species feed on the lantana fruits, while on some of the island groups, seed dispersal has been mainly facilitated by the introduction of exotic bird species. Birds are very important in exacerbating the weed problem and should not be underrated. By feeding on exotic species such as lantana, birds may increase the density and distribution of the weed at the expense of native vegetation thereby displacing other\r\nbird species (Loyn and French 1991, in Day et al. 2003). Lantana seeds need high light conditions for germination and early growth (Gentle and Duggin 1997b; Duggin and Gentle 1998, in Day et al. 2003), and seedlings are unlikely to survive beneath parent bushes. The germination rate of lantana is low under both laboratory and field conditions, with estimates of 4–20% (Graaff 1987) and 44.5% (Duggin and Gentle 1998, in Day et al. 2003). Germination rates increased from ten per cent to 46 per cent when the fleshy pulp was manually removed from the seed. This higher germination rate is comparable to that obtained from seeds collected from the faeces of wild birds. Seeds germinate at any time of the year given sufficient soil moisture, with most seed germinating after the first summer storms in northern Australia (Parsons and Cuthbertson 2001, in Day et al. 2003). Dutch explorers introduced the plant into the Netherlands in the late 1960s from Brazil (Ghisalberti 2000) and it was then grown in glasshouses in Europe before its importation to other countries as an ornamental (Day et al. 2003). 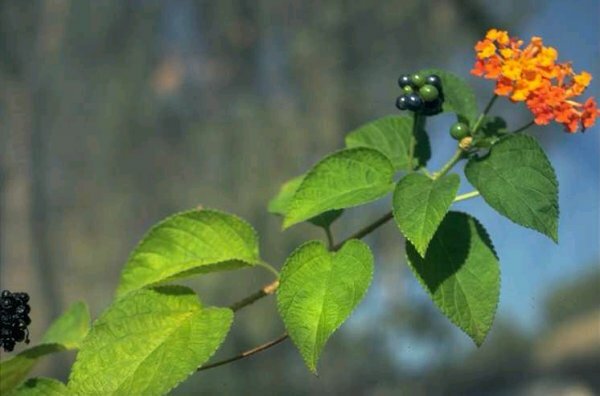 Recommended citation: Global Invasive Species Database (2019) Species profile: Lantana camara. Downloaded from http://www.iucngisd.org/gisd/species.php?sc=56 on 19-04-2019. Lantana is now a major weed in many regions of the Palaeotropics where it invades natural and agricultural ecosystems (Thomas and Ellison 1999). The plants can grow individually in clumps or as dense thickets, crowding out more desirable species. In disturbed native forests it can become the dominant understorey species, disrupting succession and decreasing biodiversity. As the density of lantana in forest increases species richness decreases (Fensham et al. 1994, in Day et al. 2003). Its allelopathic qualities can reduce vigour of plant species nearby and reduced productivity in orchards (Holm et al. 1991, in Day et al. 2003). At some sites, lantana infestations have\r\nbeen so persistent that they have completely stalled the regeneration of rainforest for three decades (Lamb 1991, in Day et al. 2003). Such is its impact that, for example, in south-east Queensland lantana was ranked as the most significant weed of non-agricultural areas (Batianoff and Butler 2002, in Day et al. 2003). Lantana competition may have caused the extinction of the shrub Linum cratericola Eliasson (Linaceae), and is a major threat to other endangered plants in the Galapagos Archipelago (Mauchamp et al. 1998, in Day et al. 2003). The replacement of native pastures by lantana is threatening the habitat of the sable antelope in Kenya (Greathead 1971b, in Day et al. 2003). 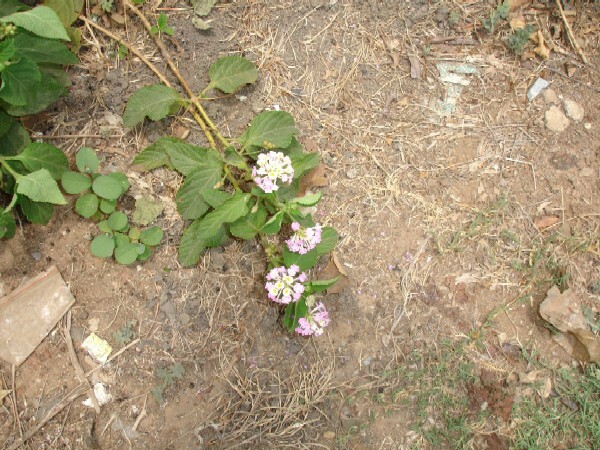 Lantana has many secondary impacts, especially in many tropical countries where it can harbour several serious pests. Malarial mosquitoes in India (Gujral and Vasudevan 1983 in Day et al. 2003) and tsetse flies in Rwanda, Tanzania, Uganda and Kenya shelter in bushes and are the cause of serious health problems (Greathead 1968, Katabazi 1983, Okoth and Kapaata 1987, Mbulamberi 1990 in Day et al. 2003). The key to good management of lantana is constant vigilance (Day et al. 2003). Repeated control of regrowth is critical to success. Control of new infestations should be a priority because the species is able to expand its range during good seasons. Mechanical: Mechanical clearing and hand pulling are suitable for small areas and fire can be used over large areas. Fungi have been used for many years to control arthropod pests but have been underexploited against invasive weeds. Evans (1987) considered fungal pathogens to have great potential as agents for classical biological control of weeds. Barreto et al. (1995) examined the mycobiota of L. camara in Brazil and selected several fungal pathogens as potential biological control agents including Prospodium tuberculatum, Puccinia lantanae and Ceratobasidium lantanae-camarae. P. tuberculatum is a rust limited to the tropical and subtropical regions of North and South America. Glasshouse inoculations indicate that the agent is pathogenic to two major weed biotypes in Australia: the Common Pink (a highly invasive biotype) and Pink-edged Red (extremely toxic to cattle). 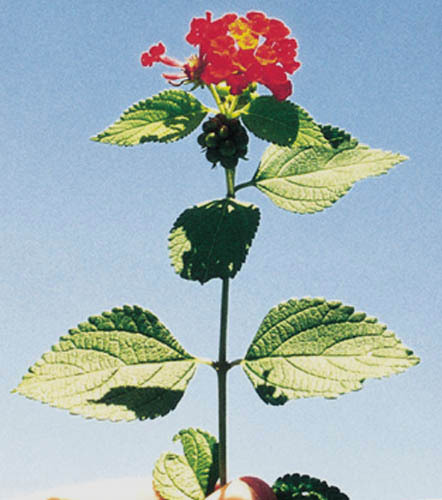 P. lantanae is a rust of tropical origin and initial results show that it is pathogenic to a wider range of weedy cultivars of lantana than P. tuberculatum. Successful infection has been obtained with ten biotypes to date: two from Australia, three from South Africa, two from Madagascar and one from Thailand, India and Hawaii (Thomas and Ellison 1999). A strain of the rust Prospodium tuberculatum from Brazil was screened as a potential biocontrol agent against 40 Australian Lantana camara forms and 52 closely related, non-target plant species. Results under glasshouse conditions showed that the Brazilian rust strain is pathogenic to only two flower colour forms: pink and pink-edged red. Macro- and microsymptoms were recorded using 11 assessment categories and four susceptibility ratings. No macrosymptoms were observed on any of the non-target plants (Thomas et al. 2006). Informations on Lantana camara has been recorded for the following locations. Click on the name for additional informations. Australian Department of the Environment and Heritage, 2003. Lantana (Lantana camara). Weeds of National Significance: Weed Management Guide Department of the Environment and Heritage and the CRC for Australian Weed Management, 2003. 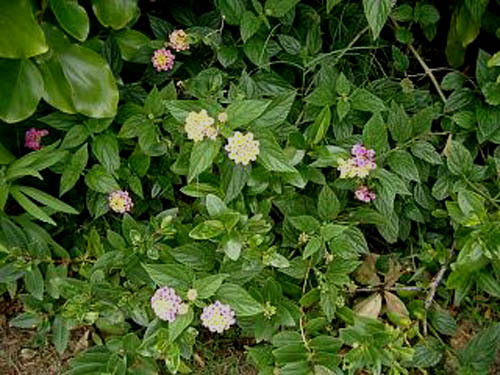 Summary: This site provides information on the strategy for the management of Lantana. Documents available for download include the strategy, Lantana control manual, brochures, posters and current and potential distribution maps. Berry, Z. C., Wevill, K. and Curran, T. J. 2011. 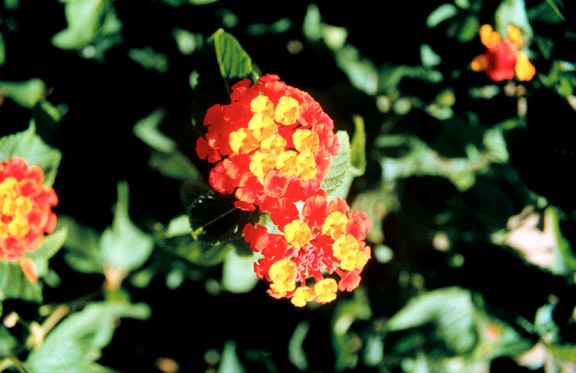 The invasive weed Lantana camara increases fire risk in dry rainforest by altering fuel beds. Weed Research, 51: 525�533. Day, M.D., Wiley, C.J., Playford, J. and Zalucki, M.P. 2003. Lantana: Current Management, Status and Future Prospects. Australian Centre for International Agricultural Research: Canberra 2003. Ellison, C.A. 2001. Classical Biological Control of Weeds With Pathogens: Release of Lantana Rust in Australia. In: IBG (International Bioherbicide Group) News 10 (2). Pallin, N. 2000. Ku-ring-gai Flying-fox Reserve, Habitat restoration project, 15 years on. Ecological Management and Restoration 1(1):10 April 2000. Summary: Discusses impacts species has had on a Reserve in Australia. Examines chemical and physical control methods and how control has been reached. Parson, W. A. and Cuthbertson, E. G. 1992. Noxious weeds of Australia. Summary: Plant species declared noxious in Australia. Available from: http://www.hear.org/pier/species/lantana_camara.htm [Accessed 18 August 2003]. Thomas, E. Sarah and Carol, E. Ellison, 2000. A Century of Classical Biological Control of Lantana camara: Can Pathogens Make a Significant Difference? In: Neal R. Spencer (Ed.). Proceedings of the X International Symposium on Biological Control of Weeds 97. 2000. Thomas S E, Ellison C A, Tomley A J 2006. Studies on the rust Prospodium tuberculatum, a new classical biological control agent released against the invasive alien weed Lantana camara in Australia. 2. Host range. Australasian Plant Pathology 35, 321�328. Florence J. Chevillotte H. Ollier C.& Meyer J.-Y. 2007. Lantana camara Base de donn�es botaniques Nadeaud de l Herbier de la Polyn�sie fran�aise (PAP). Holm, LeRoy, Pancho, J. V., Herberger, J. P. and Plucknett, D. L. 1979. A geographical atlas of world weeds. New South Wales (NSW) National Parks and Wildlife Service, 2001. Declaration of critical habitat for Mitchell�s Rainforest Snail (Thersites mitchellae) in Stotts Island Nature Reserve. NPWS, Hurstville, NSW. Sastri, C.S.T. and Kavathekar, K.Y. (1990). Plants for reclamation of wastelands. Pbl. P & I Directorate, CSIR, New Delhi, India p. 296-298. Summary: Biology of Lanatana camara. Shimizu, Y. 1997. Competitive relationships between tree species of Salesia (S. pedunculata, S. cordata, S. microcephala) and introduced plants (Cinchona succirubra, Psidium guava, Lantana camara) with reference to regeneration mechanism of Scalesia forests in the Galapagos Islands. Regional Views - Komazawa University Tokyo 11: 23-172. Singh, U., Wadhwani, A.M. and Johri, B.M. (1996). Dictionary of Economic plants of India. Pbl. Indian Council of Agricultural Research, New Delhi, India. p. 118. Summary: Uses of Lanatana camara. Locked Bag 40, Coorparoo DC 4151, Queensland, Australia.